Charles Fitzroy was the illegitimate son of Charles Fitzroy, 2nd Duke of Grafton whose father had himself been an illegitimate son of Charles II by Barbara Villiers. The name was perhaps indicative of his lineage and he took the name of Scudamore on marrying the Hon Frances Scudamore (1711-50). He is recorded (described as Colonel Fitzroy) as paying rates in Twickenham from 1750 until 1765 with a gap in 1753. The house he occupied was owned by Joshua Spyres (d1768), described as 'The Great House', in Joshua's Will of 1767, adjacent to Spyers' own house. 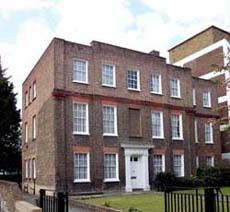 It is likely that this house was the one later called Grosvenor House, in Grosvenor Road, Twickenham, which has survived. Later, John Spyers, Joshua's nephew inherited and lived in this house. Frances Scudamore had married, first, Henry Somerset, 3rd Duke of Beaufort who died in 1745. They had divorced in 1744 and she enjoyed a rather doubtful reputation. She was the only daughter of James, 3rd and last Viscount Scudamore of Holme Lacy. 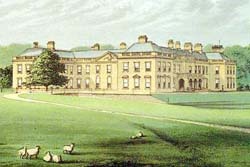 This estate became, following much litigation, the seat of the Stanhope family. Her mother, Frances Digby, was the niece of William Digby, 5th Baron Geashill and had introduced Alexander Pope to that family. Pope mentions her first in a letter to Robert Digby dated 31 March 1718: "...My Lady Scudamore, from having rusticated in your Company too long. really behaves herself scandalously among us: she pretends to open her eyes for the sake of seeing the Sun, and to sleep because it is Night; drinks tea at nine in the Morning, and is thought to have said her prayers before; talks without any manner of shame of good Books...."